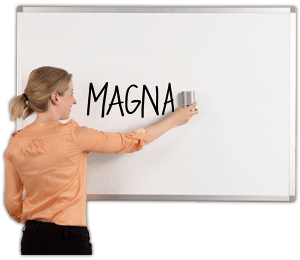 Magnatag® Whiteboards are built to last. Our proprietary MagnaLux® dry-erase Whiteboard Surface will not stain, crack or fade over a lifetime of daily use. We use a stress skin structural technology to ensure that our boards will not bow or warp over time. We adhere every square inch of our MagnaLux® steel to a honeycomb core and aluminum backer which makes for a completely flat structural board. We wrap our board with a handsome, heavy duty 1 inch BoldLyne® anodized aluminum frame. Our heavy duty frame protects the edges from impact and it's built-in channel makes Installation easy. 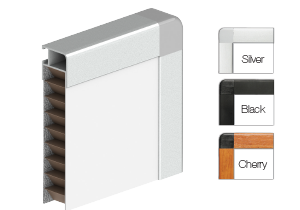 Our whiteboard frames come in silver, black or cherry wood color options. Over 47 years of testing and perfecting our MagnaLux® formula we can confidently say that it’s like no other, when it comes to erasability and printing performance. Our MagnaLux® formula will not stain, crack or fade after years of day to day use. Unlike glass boards or Melamine/Fiberboard Products our enamel surface is evenly applied to a steel sheet giving our MagnaLux® surface it's superior magnetism. Our formula has been perfected to give us the ability to print high definition images directly into the surface of our dry-erase enamel. Because we are printing directly into the surface, your image will stay as vibrant as the day you receive it. Over the years we have perfected a printing process that when combined with our Magnalux® surface, produces a high definition, permanently printed whiteboard. NO LAMINATES or OVERLAYS. When we print a board, the ink permanently penetrates the enamel dry-erase surface for a lifetime of write-on wipe-off use. We transfer the ink using a carrier sheet. The sheet is then placed on the board with extreme precision. 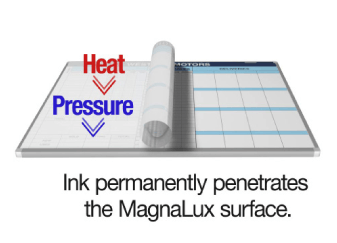 Using a proprietary blend of heat and pressure, we are able to transfer the ink from the carrier sheet directly into the enamel Surface of our whiteboards. Our boards are vivid with the highest definition prints in the industry. We also are proud to say that we can print HD Images on steel up to 4 by 12 feet. Almost all of our systems come with specifically designed magnetic kits. 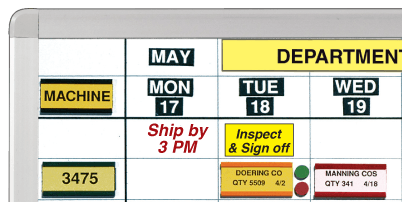 Each kit is designed to enhance the boards communicative capabilities using flexible and easy to update color-coded magnets. Each magnet is sized perfectly to fit the cells of your system. Option 1 Safety Hooks:Bail hangers are fastened on the back of the whiteboard every 16 inches to correspond to standard frame construction. Fasten Safety Hooks to wall studs at the desired height and loop bail hangers over hooks to mount your whiteboard. Option 2 FrameKlamps™:This option allows fine tuning your whiteboard location left to right when wall studs are not in ideal location for board mounting. Once your board is in the desired location simply rotate the lever on the FrameKlamps™ to lock your whiteboard in position.